Anticipation is building in the run-up to presentations of the best-yet evidence for – or against – the existence of the Higgs boson. Rumours have been swirling about the findings for weeks, ahead of the announcement on Tuesday afternoon. The famed particle is a missing link in current theories of physics, used to explain how everything gains its mass. It is likely to yield only tantalising hints, as the teams do not have enough data to claim a formal discovery. Rumours have it that two teams nick-named the “Higgs-Hunters” at CERN were able to catch only a handful of the long sought-after particle, amid original calculations that each week should give them thousands. And the disappointing low number of particles catched in the CERN detectors mounted to a barely significant evidence for their existance at all. Now it seems that a yet unknown group of self-declared slimness-fighters started a sabotage crusade against the official Higgs-hunters at CERN. Already month before the super-sensitive and exorbitant expensive Higgs-detectors were switched on at the Geneva research facility, this anonymous gang invented an easy method to severly reduce the number of freely-available Higgs-Bosons: simply by eating them. In a letter that was received this morning by BBC and is signed by the executive board of the sabotage group (calling themself “The Higgs Particle Thiefs”) some of the group members pose in front of the camera while celebrating their success: Each of them claim to have swallowed at least a couple of thousands of Higgs Particles during last month, and all say they still feel fine. They also believe they can show now by themself that the Higgs-Particles are really the source of mass. They estimate that eating one Higgs-Particle increases the persons body mass by about 0.31814 lb. Although the woman involved in this illegal experiment could not sense any particular flavour of the eaten Higgs-particles (Standard model indeed predicts them to be flavourless), preliminary observations of all woman indicate that the particles caused a dramatic symmetry violation when they were incorporated in the human body: All persons exhibit a severe drop of the quantum state Charm (from initially C=+2/3 down to C=-100) and an increase in Strangeness (from initially S=-1 up to S=418.6/7). One completely unexpected observation that still lacks any reasonable explanation is related to the changes that the Higgs-bosons induce in the different tissue-types of the human body. After ingestination of the Higgs-particles there were marked differences between the involved woman in terms of where in the organism the Higgs-mass was transfered to. 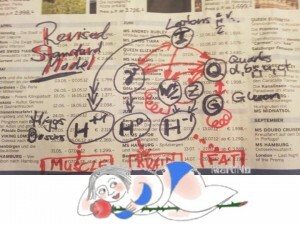 In most of the experimental woman, a sever increase in subcutaneous, non-visceral fat tissue was observed. In about 12% of the probands, however, the Higgs-bosons did not interfered with fat-tissue, but increased the lean-mass, mostly muscle tissue but also bone, instead. A small, but reproducible fraction of probands experienced an increase in the brain mass. This observation suggests that the Higgs-boson exists in triplet-form, and hence must be assigned a novel quantum number SH (for shape). Most Higgs-bosons have SH=-1 (i.e. interact and transfer mass to adipose/fat tissue). About 12% of the terrestrial Higgs-bosons carry SH=+1 (i.e. interact with and increase muscle and bone tissue), and 3-5% are SH=0 (i.e. increase only in brain mass, without changing body shape). The reason for this asymmetry of the 3 SH quantum states is currently unknown, but might be specific for the geographic origin of the Higgs-particles (the Higgs-particles thieves as well as the Higgs-bosons themself were all british !!). has to be extended with an further SU(3) group, finally resulting in the new Lie-group with SÖ(13) symmetrie. To some rebellion particle physicists, however, the tripple-state of the Higgs-Boson is nothing but an requirement to fit this new particle into the “zoo” of already existing elementary particles. It is an established fact that both quarks (constituents of the hadrons such as neutrons and protons) as well as all leptons (electrons, neutrinos, muons) exist in three different generations. Why the Higgs-particle, assumed to be a boson and hence not belonging to classical elementary particles, resembles characteristics of a these constituents of matter, remains to be elucidated.